The Interactive maps and program locator search pages are not connecting to Google maps and are not working. I created this PDF to show developers what the pages should look like, when working. Still have Error code in the part of the web sitedescribe link where I collect and edit data on programs which feeds the interactive map and search page. Need to also find way to edit the home page using Front Page which Dan has on one of his computers. Site not edited for several years. Dan paying fees from own pocket; Need $90 per month for server fees and 10 hrs/week tech support. In 1993 when the Tutor/Mentor Connection was created, it's first goal was to survey Chicago to learn what organizations were offering various forms of tutoring and/or mentoring. Without this information it would be impossible to know if the number and distribution of programs throughout the city had grown as a result of any funding or marketing place launched by government, philanthropy, media, and/or business. We have never had adequate resources to do this, but have done the best work possible with the help of volunteers and an inconsistent flow of dollars. Below is a history of work done, which show work that still needs to be done. As a survey was created and launched in 1994, the question became "how do we share this information and help people understand where different programs are located?" The sharing question led to the publication of a printed directory of programs, with the first directory being distributed in May 1994 during the first Tutor/Mentor Leadership and Networking Conference. The how to help people understand question was resolved when we were introduced to the concept of Geographic Information Systems (GIS) which provide the ability to visualize spatial data, using maps and charts. Every year since 1994 the T/MC has worked to update its database of programs and keep the information current. At the same time we printed a directory and mailed 3,000 to 4,000 copies to the programs in the directory, to schools, libraries, social service agencies, business and foundations. Our aim was to help people know where programs were located, and where there were voids so that volunteers, donors and businesses could support existing programs and start new programs in areas where they are needed. At the same time the service was helping parents and social workers find programs where kids could be enrolled. The challenge of keeping the data current has always been one that plagued the T/MC since here was not dedicated funding for the T/MC. We had part time people, interns and volunteers reaching out to over 400 different locations each year to confirm that a program was still in business and to update the data. In 1993 we received a $20,000 grant from the Community Technology Centers network and used this to create the first version of the Program Locator, which moved the data to the internet and enabled users to search to determine what programs were in what zip code. In 1995 and 1996 this was linked to various forms of Maps, so you can click on a part of the map to find programs in that zip code. 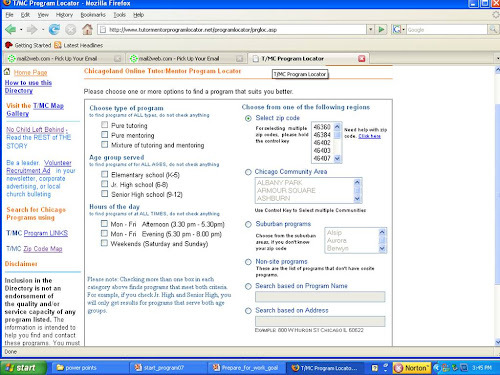 In late 2006 a new version of the Program Locator made it possible for programs to add or edit their own program information, and made it easier for staff at the T/MC to add, update, or delete program listings. This system still is in development and there is not on-site tech staff to support the workings of the Program Locator. In 2008 we created the Interactive Map-Based Program locator with the data from the survey directly linked to the type of Geographic information System that we have been seeking since 1994. In 2008 we added the interactive map to the Program Locator web site making it possible for people to first look at all of the places where tutor/mentor programs were needed, then to see what the current distribution of existing programs looks like. People can then zoom into specific areas of the city to find contact information from the Program Locator database and to identify assets who could be working to help programs in that zip code grow. As stated above, I created this PDF to show what the pages in the site should look like, when working. The two PDFs that I refer to in the next two paragraphs also should be reviewed to see what pages in the program locator look like. When the Program Locator is working properly administrator staff can add and edit information in the Directory, and programs can add/edit their own information. This PDF shows how the updating works…WHEN the site is working properly. Using the interactive maps, anyone can create map-views that tell a story of tutor/mentor programs in different neighborhoods, along with assets (like business, churches, colleges, hospitals, etc) who share the same geography and should be supporting the growth of tutor/mentor programs in these areas. This PDF shows features of the Program Locator that and how maps can be made…WHEN the site is working properly. If you are interested in supporting this project, or working on it, or even duplicating it in another city, contact Dan Bassill at Skype: dbassill or ten.knilhtrae|2rotnemrotut#ten.knilhtrae|2rotnemrotut . You can also introduce yourself in the GIS group on Ning.